This was a sea chantey, used with the windlass, and the capstan.The lead man would sing the first and third lines of each verse and the crew would sing on the second and fourth lines, as they did their work, with winches for loading cargo, raising sails, pulling up anchors, and other jobs on deck. Some believe the song originated among the early American river men, or Canadian voyageurs. Others believe it was a land song before it went to sea. Most agree that it incorporates both Irish and African-American elements. 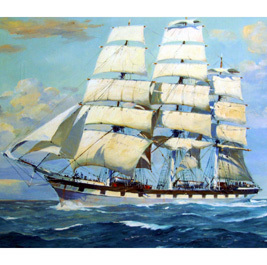 Shenandoah was tremendously popular both on land and sea and was known by countless names, including: Shennydore, The Wide Missouri, The Wild Mizzourye, The World Of Misery-Solid Fas (a West Indian rowing shanty that may be older than other versions), The Oceanida, and Rolling River. 'cross the [B7] wide [E] Missouri!